Search Engine Results Pages (SERPs) are highly competitive these days, with thousands of pages competing for each subject known to man, and so being able to make your own web pages stand out against your competition is becoming harder and harder. Being on the first page of SERPs isn’t a guarantee of a large audience, at times being the second or even first natural / organic result might not get you many clicks if there are two or three “sponsored links” above your page that hog the limelight. There are many different methods for attempting to make your pages stand out, a catchy title, meaningful description or a helpful Rich Snippet, but one method in particular may be far more useful and rewarding than any other, and that method is highlighting you, the individual or the publisher as the creator of the content to your potential audience. If you’re an article writer, story teller, reviewer, blogger, vlogger, tweeter or any other such content producer that makes a regular attempt to write and create, then Google might be willing to show people that you’re the creator of a particular piece of content directly in the search results. If you’re building up a name for yourself online, with whatever content you’re creating, then this can encourage people to seek you out, because they trust your judgement, respect your views or simply enjoy what you produce. They are interested in what you have to say. A search result can highlight the authors name, as well as provide links to more content from the specified author. You may also see the number of people in the authors Google+ “circles”, which is similar to “friends” on Facebook. Using this method, if someone searches for a new video game or movie release, and sees a review with your name on it, they may be more willing to click on to your page, because they value your content above anothers. 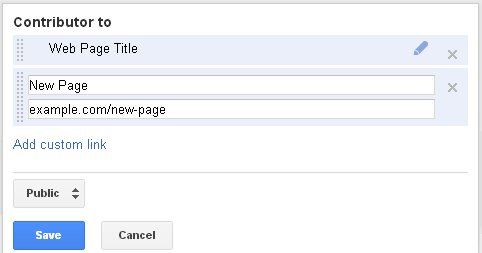 There are a couple of methods of having your pages show up with authorship information next to a search result. You will need to have a Google+ account, and your profile will need to include a picture of you has the main profile picture. Once you have this, you will have to link your profile to the pages you are the author of, which could be a review, blog, articles, etc. On each web page you want to add authorship information to, you will need to add a single line of HTML code linking the page to your Google+ profile, either using a reference within the opening <head> and closing </head> elements of the page, or by adding a hyperlink on the actual page itself. The web address above is only an example, and will need to be replaced with the web address of your own Google+ profile. The query string "rel=author" is a requirement by Google, and needs to be preceded with a question mark. You will then need to add the web addresses of the web pages with authorship information to your “Contributed To” section of your Google+ Profile. By doing this, Google can see which web pages you claim to have authored, and checked that your Google+ Profile is within the web pages as well.